All this of course, allows for a beautiful and interrupted view of the flames, with all the benefits of a real log fire. 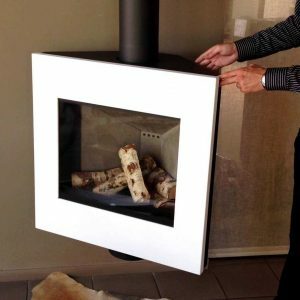 When beginning the search for a wood-burning stove, it can seem like a lot to take in. With so many stoves on the market, it can be hard to know what to look for. 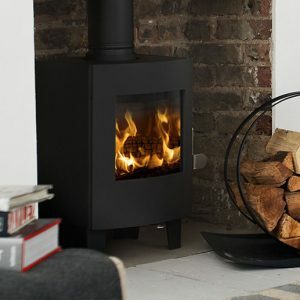 You want a stove that will work well for your room in terms of heating, and one that will also be lovely new addition to the aesthetics of your space and will last for many long winters ahead. It is important to find a reputable dealer, who supplies high quality, high efficiency, well-made stoves. 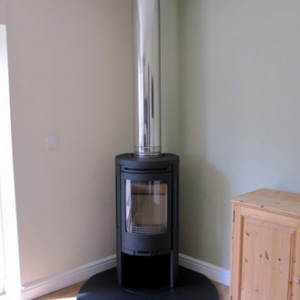 A high quality modern stove will have a secondary or tertiary burn aspect. Otherwise referred to as ‘Cleanburn’. Warm air is circulated via chambers back into the stove firebox. This allows previously unburned products of combustion to re-ignite. The result is a cleaner burn with less soot going up the chimney and into the atmosphere. More heat is thus created and higher stove efficiency is maintained. There will also be an airwash system, to help keep the window clean. All good modern stoves will have an efficiency rating of 70% or more. If efficiency is something you would like to prioritise, you can check the individual stove efficiency ratings and compare your choices. 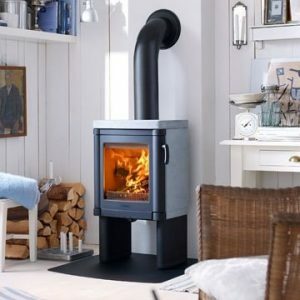 Also look out for SIA and DEFRA approved stoves, as these have been tested for efficiency as well as ensuring they have minimal impact on our air pollution. Open fires offer only around 10% efficiency so with a stove you get more heat for your fuel. One of the first important things to have is a good idea what kilowatt output is required to adequately heat your space. The vast majority of stoves are sold as individual appliances designed to provide a cosy atmosphere in a single room. You can get a general idea about the kilowatt you need by measuring the space in cubic metres; (L x W x H) and dividing this figure by 14. This provides rough estimate of the kilowatt (kW) output required. You can also click the link below and use our Heat Output Calculator. It is important to remember that other factors will influence heat requirement, so you should always consult a qualified heating engineer as well. 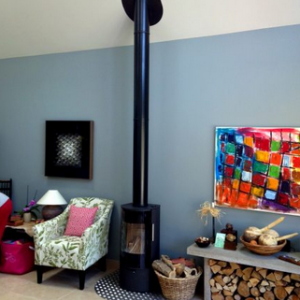 Convective stoves not only have some radiant heat but also use convection chambers to aid in warming cool air, and circulating it throughout the room. These are particularly usefull for larger open plan spaces. They also often require smaller clearances for installation. A radiant stove mostly heats objects (and people!) in its near vicinity. Natural convection still occurs and some radiant stoves have a convection system in place as well. If you live in a smoke control area, you will need a DEFRA approved stove. Many stoves now come with the smoke control system as standard, but you do need to check this when choosing. 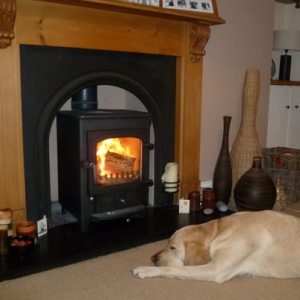 With a Defra approved stove, you can burn wood and/or smokeless coal even in towns and cities. The best fuel to use is well seasoned wood. This is what modern stoves are designed to burn with the greatest efficiency, and minimal environmental impact. There is the option of also burning coal with a Multi-Fuel stove. The benefit of this may be the longer burn time, but nowadays, with stoves burning wood so efficiently there is very little difference. Coal is a fossil fuel and burning it results in the release of a lot of CO2 which drives climate change. It is also more corrosive to the stove parts and liner, therefore if you want to use it, it is recommended to use around 80% wood and to supplement this with coal. 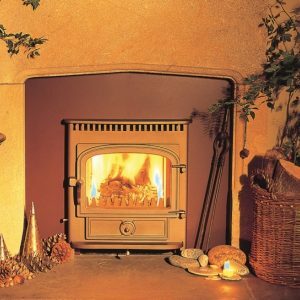 In a smoke control area smokeless coal must still be used in any stove, even if it is DEFRA approved for burning wood. 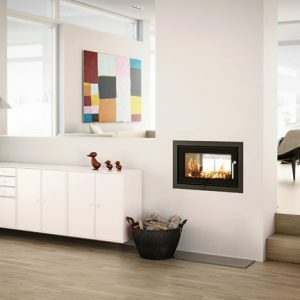 Contura i5 3-9KW. Panoramic door teamed with our 'Lansdown' surround in Portugese Limestone. 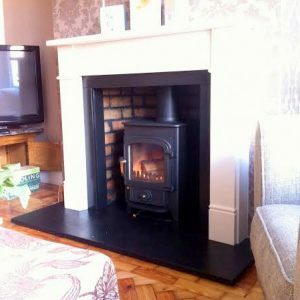 Clearview Pioneer 5 KW On Honed Slate hearth. If there is no chimney, then a Twin Wall Flue system is used, where a pre fabricated double walled flue is installed to safely take the combustion gases out from the stove. 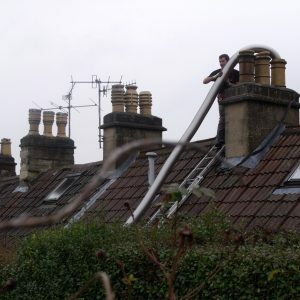 (Sometimes, a combination of these two types of flue can be used). 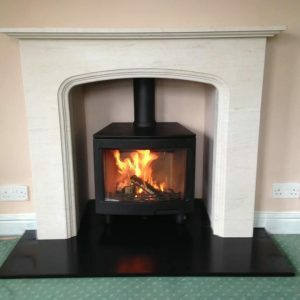 Contura 510 3-7KW On tear drop hearth. Rais Rina 4KW With black Twin Wall flue . Also available in soapstone model. If considering getting home on a cold day and needing the heat on as quickly as possible, a steel stove – or one what makes the best of both materials may be a good choice. There are two options for the stove material, cast iron, or steel. Cast iron takes longer to heat up and cool down, although with modern stoves, this difference in heat up time compared to steel is narrowing. But if considering getting home on a cold day and needing the heat on as quickly as possible, a steel stove – or one what makes the best of both materials may be a good choice. The more obvious difference with these materials is the look and feel of the stove. Cast iron stoves can have a comparitively solid feel – and it is often used in traditional fireplace stoves. They may also have some relief detail on the classic styles. 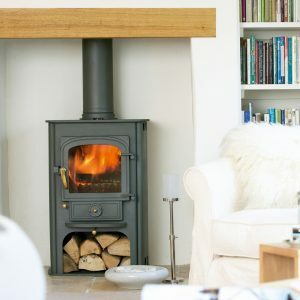 Welded steel stoves are more simple, with clean lines, which also makes it a great material for contemporary stoves that offer seemless, cutting edge designs. There are other materials you will see mentioned when looking around, notably soapstone, concrete, sandstone or heatstone. These stones hold heat and are used in various forms both on the inside and outside of stoves. 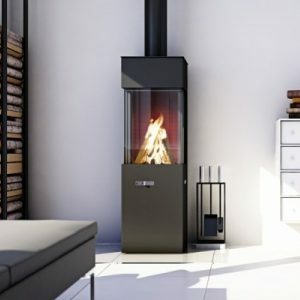 Contura 52T 5KW. With soapstone top and sides. 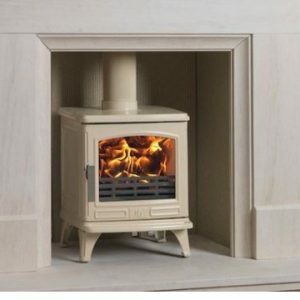 There are traditional and contemporary stoves to suit all preferences. 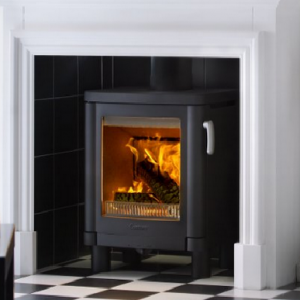 The enduring basic black firebox on legs comes in an array of different styles from classic with cast iron shaping, such as the Clearview Pioneer to the very contemporary, glass fronted Rais Q-Tee. The beautifully classic, Clearview Pioneer 5KW has a steel body and cast iron door, making the best of both these materials. 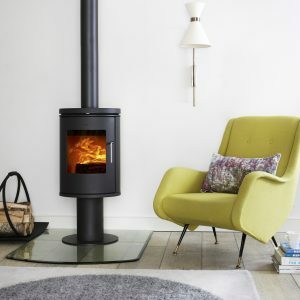 Clearview also have a range of beautiful, higher KW stoves; (More Clearview Stoves here). The modern Rais Q-Tee is 5KW can have a glass fronted door, and is available in different base height options. An 8KW version is available in the Rais Q-Tee 2. 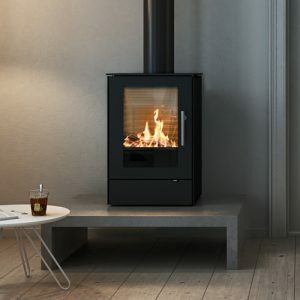 The Contura 51L 5-6KW offers a very large view of the fire, always a bonus! Contura I4 Modern inset 5KW stove raised install with log storage area. Open plan spaces often call for a taller stove. Many of the smaller stoves are available in taller versions. 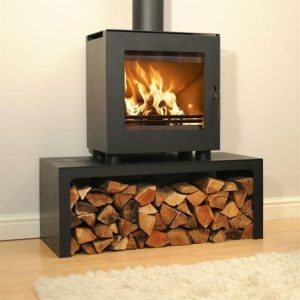 You could also opt for raising a stove using a plinth or separate logstore. As well as with the smaller stoves, you can look into the extra choices, such as side windows, hot plates, heat stones, or stoves that can be rotated - a useful feature for a larger space. The Clearview Solution 400 5KW has convection side panels. 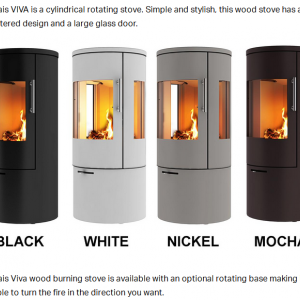 Rais Viva 4KW- Rotating base option, available in a choice of colours. 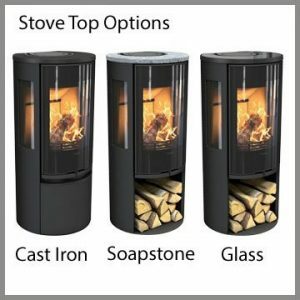 A summary of the main things to consider when choosing the right stove for you..
-The Style you would like, very modern, or traditional? The most suitable type for your space, small or open plan? -Fuel. Wood is best. A Multi-Fuel can be supplemented with coal. Hopefully this has answered some intitial questions and will help to narrow down your selection toward the ideal stove for you. For further help do visit us in one of our showrooms. 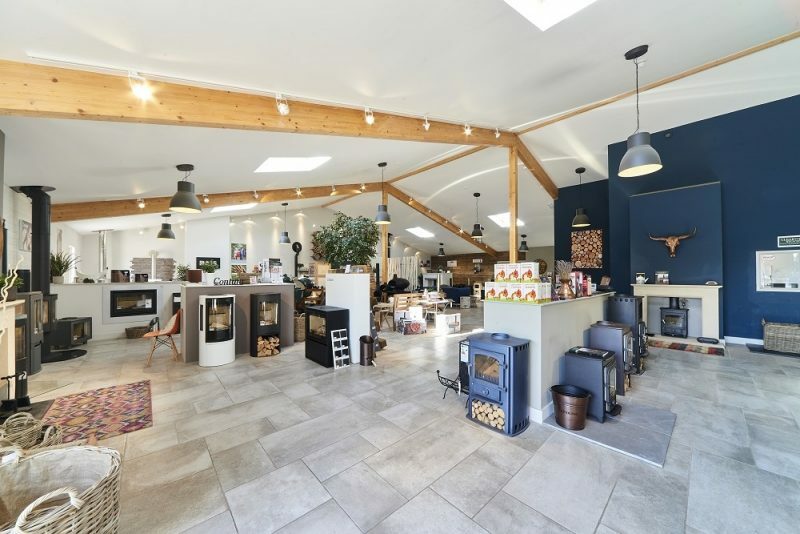 We will be very happy to help in your search, provide further information on any of the stoves - or to book you in for a site visit with one of our experienced Hetas registered engineers.